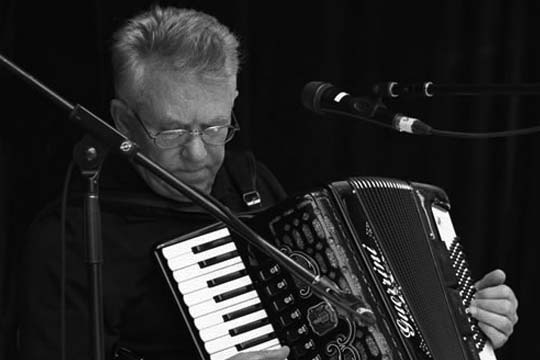 The Newfoundland & Labrador Folk Arts Society, organizer of the 37th Annual Newfoundland & Labrador Folk Festival, is proud to announce that the festival has selected renowned Newfoundland accordion player Ray Walsh as the recipient of this year’s Lifetime Achievement Award. Walsh has greatly contributed to the cultural fabric of this province through his talent and passion for the music. Ray Walsh has been playing traditional music in Newfoundland for almost as long as he can remember. As a young man, Ray played at dances and gatherings in Bay de Verde, Conception Bay; he was a featured performer on CBC Television’s All around the Circle from 1964 until 1975, and has been featured on many television and radio shows in a career spanning nearly fifty years. He has contributed to many recordings and concert tours for performers John White, Joan Morrissey, Kevin Collins and many more, and in 1995 formed the Walsh Family Band with his brother Gerard, son Greg, and daughter Michelle. Ray has toured extensively, playing as far afield as Mexico and Ireland. He is a strong proponent of Newfoundland’s traditional music, having served on the board of the Newfoundland & Labrador Folk Arts Society, and has been featured on the main stage of the Newfoundland & Labrador Folk Festival on numerous occasions. Ray has released six albums of Newfoundland, Irish and Scottish music, and continues to entertain audiences in Newfoundland & Labrador and beyond. The Newfoundland & Labrador Folk Arts Society is delighted to honour Ray Walsh as this year’s recipient of the Lifetime Achievement Award.